TAP Air Portugal is the flag carrier airline of Portugal, headquartered at Lisbon Airport which also serves as its hub. TAP – Transportes Aéreos Portugueses – has been a member of the Star Alliance since 2005 and operates on average 2,500 flights a week to 87 destinations in 34 countries worldwide. The company has a fleet of 90 airplanes, 68 of which were manufactured by Airbus and the remaining 22 by Embraer and ATR, operating on behalf of the regional airline TAP Express. In June 2015 the company was semi-privatised and became majority-owned by the Atlantic Gateway Consortium, led by David Neeleman, who founded JetBlue and Azul Brazilian Airlines and co-founded WestJet, together with Portuguese entrepreneur Humberto Pedrosa. The Atlantic Gateway Consortium purchased 61% of the carrier from the government of Portugal on 24 June 2015, with an option to buy the Portuguese government's remaining 34 percent stake in 2018. This deal has been surrounded in controversy because it was completed at the end of the center-right government's mandate with wide opposition from TAP employees. On October 2015, a new left-wing government has sought to return majority control of the airline to the state, having signed in February 2016 a deal with the private consortium, which indicates that the company is 50% owned by the Portuguese state, 45% by the Atlantic Gateway Consortium and 5% available shareholder to collaborators and employees of TAP Air Portugal. The airline, founded on 14 March 1945 as Transportes Aéreos Portugueses (Portuguese Air Transportations), began commercial services on 19 September 1946, with a flight from Lisbon to Madrid using a Douglas DC-3. On 31 December, TAP Air Portugal began its Linha Aérea Imperial, a twelve-stop colonial service including Luanda, Angola and Lourenço Marques (now Maputo), Mozambique. It covered 24.450 km within 15 days (both ways), making it the longest air service operated with twin-engine airliners. In 1947 domestic services commenced from Lisbon to Porto as well as from São Tomé to London. Four Douglas DC-4 Skymasters were purchased in this year, remaining in service until 1960. These were used on the routes to Africa and to major European destinations including London. The airline was privatised for the first time in 1953, changing from a public service to a public limited company (plc) and began in the same year services to Tangier and Casablanca. 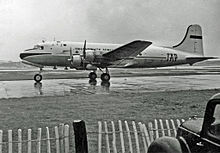 Lockheed Super Constellation four-engined pressurised airliners, acquired in late 1955, were immediately introduced on the TAP African scheduled services to Luanda and Lourenço Marques. That same year Admiral Gago Coutinho made a test flight to Rio de Janeiro. Beginning in 1960, TAP Air Portugal launched Rio de Janeiro as its first destination in Brazil, in a jointly-operated air service named "Voo da Amizade" ("Friendship Flight") with Panair do Brasil (1960-1965) and Varig (1965–1967). A route from Lisbon to Goa, a 19-hour flight with five stopovers, was added to the network in the beginning of the 1960s. 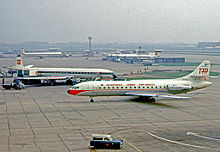 TAP entered the jet era in July 1962, when three Sud Aviation Caravelle twin-jet airliners were acquired and operated on the airline's most competitive European routes. The one-millionth passenger flew on TAP on 19 June 1964, 18 years after the airline began operations. In 1966 TAP operated its first sole flight to Brazil, when a company Boeing 707 landed at Galeão Airport in Rio de Janeiro, on 17 June at 17:32 GMT. Precisely at the same time and on the same day as the hydroplane Santa Cruz moored in Guanabara Bay in 1922, when Sacadura Cabral and Gago Coutinho made their historic South Atlantic crossing. The route to Brazil was inaugurated. In 1967, the airline achieved a milestone: it became the first European airline to fly exclusively with jets. In 1969, service to New York City via Santa Maria Island began. Boston was added to the New York service in 1970. The first of four Boeing 747-200s was received in 1972. TAP began 1974 with 32 aircraft operating to more than 40 destinations on four continents, it began offering computerised reservations, load control and check-in (known as Tapmatic), and became the first European airline to carry out major comprehensive overhauls of Boeing 747 engines. By the end of 1974, TAP had carried more than 1.5 million passengers, flown 68,210 hours over a network of almost 103,000 kilometres and had a staff of over 9,000. Following the 25 April 1974 revolution, Portugal was caught up in the wave of nationalisations during the following year and TAP was no exception, thus becoming a state-owned corporation in 1975. After the independence of Angola and Mozambique, the important African market decreased tremendously and two Boeing 747s were sold in 1976. During the 1980s, the fleet of Boeing 707s and 747s was replaced with Lockheed L-1011 TriStars and Airbus A310s on long-haul routes. In 1985 TAP established its charter subsidiary Air Atlantis, providing leisure flights to most European cities, which operated Boeing 707, Boeing 727 and Boeing 737 jets. By the late 1990s, TAP had expanded its fleet by selling its older Boeing 727s and Boeing 737s, and had replaced them with Airbus A319, A320 and A321 aircraft. The TriStars were sold to Air Luxor and were replaced by Airbus A340s, giving TAP an Airbus-only fleet. In 1989, TAP became a publicly traded company (Sociedade Anónima) and their New York service moved to Newark Liberty International Airport from JFK and in 1991 introduce the service to Berlin. In 1993, TAP began flying to Tel Aviv. In 1994, TAP signed for a code sharing arrangement with Delta Air Lines for North Atlantic service. This agreement ended in 2005. 1996 saw the introduction of service to Boston via Terceira Island, the inauguration of service to Macau and the launch of TAP's website. In 1997, service began to Punta Cana and Bangkok. Flights to Bangkok and Macau were discontinued in 1998. A strategic alliance was formed with Swissair in 1997. Within the scope of this agreement, a team of professional managers arrive at TAP, led by the Brazilian pt:Fernando Pinto. Part of the agreement would lead to Swissair buying a 34% stake of TAP. Also, TAP became a member of Qualiflyer, the frequent-flyer program led by the Swiss flag carrier. Due to financial difficulties, the Swiss company ends up not buying the agreed shares of TAP Air Portugal, unilaterally revoking the partnership agreement which led to unexpected costs for the Portuguese airline in 2000, with the culmination of a legal action taken against Swissair. TAP became a member of Star Alliance on 14 March 2005, the same day on which the company celebrated its 60th anniversary. TAP Air Portugal was re-branded as TAP Portugal in February 2005. TAP also ended its code-sharing agreement with Delta Air Lines and began a new agreement with United, as part of its membership in the Star Alliance. Under this agreement United's code (UA) is placed on TAP Air Portugal's transatlantic flights and some African flights, and TAP Air Portugal's code (TP) is placed on United flights. In 2006, TAP Air Portugal signed a deal with Espírito Santo International for the acquisition of 99.81% of the Portuguese regional airline Portugália. Furthermore, it started a code-sharing agreement with US Airways on all routes between Portugal and the United States with connecting services out of Newark and Philadelphia. In 2007 TAP Air Portugal was awarded by NATO as the Best Engine/Aircraft Source of Repair for the NATO AWACS Maintenance Program. TAP Air Portugal has complete maintenance and overhaul bases in Portugal (Lisbon) and Brazil (Rio de Janeiro and Porto Alegre), and has specialised line maintenance stations in three continents: 4 in Portugal, 8 in Brazil, and 1 in Angola. It started scheduled flights to Moscow, Warsaw and Helsinki, in June 2009. After deciding to outsource its Passenger Service System in 2008, TAP migrated its reservation and inventory systems to the Altéa system managed by Amadeus. 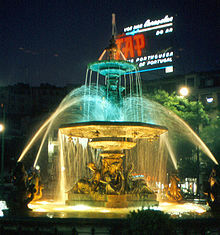 Prior to the migration to Altéa TAP was using a system derived from Delta Air Lines called Tapmatic, in use since 1972. In 2010 TAP introduced two new routes to Africa: Marrakesh and Algiers, the latter discontinued in 2017. The launch of these new routes highlighted the carrier airline reinforcement of its growth strategy for Africa, which is an important segment in the network where the airline has continually expanded since 2001, going from 236,000 to 541,000 passengers, an increase of more than 129%. Miami and Porto Alegre were the latest long range routes introduced in 2011. 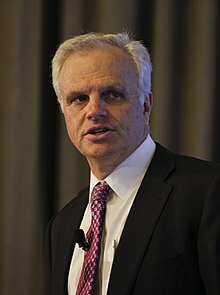 David Neeleman, co-owner of TAP since its privatisation, also the founder of Jet Blue and WestJet. Miguel Antunes Frasquilho, Chairman of TAP since 2017. In order to obtain its three-year national bailout, Portugal was forced to sell its interests in several companies, including the state-run airline. Several international operators were drawn by the airline's strategic position, but on 18 October 2012, the Portuguese government announced a sole potential bidder for the privatized national carrier: the South American consortium Synergy Aerospace, owner of Colombian airline Avianca. Portuguese financial daily Dinheiro Vivo indicated that the government would suspend privatization negotiations, if German Efromovich's Synergy Aerospace bid was not approved. On 21 March 2014 the airline announced that it would buy two ATR 42-600s for its subsidiary company, Portugália, replacing the smaller Beechcraft 1900D previously operated by PGA Express. The Portuguese government planned to sell its controlling stake in the flag carrier to one or more large investors in a relaunch of the privatisation in 2014. It intended to sell a 66% stake in the airline, with 5% of that set aside for its 7,500 staff. Among known bidders were South American businessman German Efromovich, whose 2012 bid for TAP failed to meet the initial conditions; a consortium formed by American businessman Frank Lorenzo and Portuguese entrepreneur Miguel Pais do Amaral; the American Brazilian businessman David Neeleman, founder of JetBlue in the United States and Azul in Brazil and finally Globalia, the parent company of Air Europa. In May 2015, an over-week-long pilot strike led to the cancellation of around 3,000 TAP Air Portugal flights. In June 2015, the Portuguese government decided to sell the TAP Air Portugal Group, owner of the national air carrier, TAP Air Portugal, to the Atlantic Gateway consortium formed by the partnership between David Neeleman and Humberto Pedrosa, who took control of 61% of the capital of the Portuguese flag carrier. On the memorandum signed by the new owner, TAP Air Portugal has to maintain the country as the airline’s main hub for a minimum of 30 years. The consortium that won the company's privatization in June 2015 has promised to buy 53 new Airbus aircraft for TAP. It was announced new orders would include 14 wide-body A330s and 39 narrow-body A320 Family aircraft. On October 2015, a new left-wing government has sought to return majority control of the airline to the state, having signed in February 2016 a deal with the private consortium, which indicates that the company is 50% owned by the Portuguese state, 45% by the Atlantic Gateway Consortium and 5% available shareholder to collaborators and employees of TAP. On 14 January 2016, TAP Air Portugal announced that the subsidiary Portugália Airlines would be rebranded TAP Express by 27 March 2016, as part of further restructuring measures within the group. On the same day, the Portuguese carrier also announced that the entire Portugália fleet would be replaced with new aircraft by July 2016, which would receive a livery similar to that of TAP Air Portugal. A downsize in the carrier network also took place in January, with TAP announcing the ceasing of long-haul flights to Panama City, Manaus and Bogota as well as the European connections to Hanover and Zagreb. TAP Air Portugal plans to promote Portugal, in the United States, as a vibrant and exciting tourism destination, and Lisbon as a prime gateway into Europe for North American travellers, and thus, on February 2016, the airline announced the return of New York’s John F. Kennedy International and Boston’s Logan International as daily non-stop services from Lisbon. The Boston service started on June 11 and the new JFK daily flights commenced on July 1, both being operated with new Airbus A330-200 delivered in June of the same year from Azul Brazilian Airlines. These two new routes reinforce the presence in the American market, with TAP also serving Miami from Lisbon and Newark from Lisbon and Porto. Altogether, TAP Air Portugal service grew to 30 flights per week to the US. TAP expanded its network in 2017, adding 10 routes, some which were previously operated by the airline: Abidjan (Ivory Coast), Alicante and Las Palmas (Spain), Bucharest (Romania), Budapest (Hungary), Cologne and Stuttgart (Germany), Fes (Morocco), Lomé (Togo), London City Airport (England) and Toronto (Canada). In March 2017, Miguel Antunes Frasquilho, president and CEO of AICEP Portugal Global, was selected to be TAP Air Portugal's new chairman of the board. On 14 September 2017, TAP Portugal was renamed TAP Air Portugal, going back to the name used between 1979 and 2005. TAP has its head office in Building 25 on the grounds of Humberto Delgado Airport in Santa Maria dos Olivais, Lisbon. Up until the end of 2016, TAP Air Portugal had a 51% stake in Lojas Francas de Portugal (LFP), a retail joint-venture created in 1995 between the flag carrier and Dufry. LFP is present in Lisbon, Porto, Faro, Madeira and Azores, with over 30 stores, and is also present on board of TAP Air Portugal with its "On Air" shopping magazine. Its stake in the company was sold to Vinci, the owner of ANA Aeroportos de Portugal. TAP Cargo also operates Lisbon-Luanda all-cargo non-regular flights, in an Avient Aviation DC-10F, a Girjet 747-200F, and other leased aircraft. Beginning on 28 February 2011 TAP began airing its "TAP With Arms Wide Open" (TAP de Braços Abertos) campaign, featuring its new slogan. Three singers, the Brazilian singer Roberta de Sá, the Portuguese singer Mariza, and the Angolan singer Paulo Flores starred in a music video with the song "Arms Wide Open." The music video featured TAP employees. The inclusion of the three singers was intended to highlight the proximity between peoples in the Lusophone countries. The first logo dates back to 1945, when the airline was founded. It consisted of a blue wing with the acronym TAP written to its left. The TAP museum unit was created in 1978, but it only opened officially on 14 March 1985 as part of the company's 40th anniversary celebrations. Its venue was at the company’s head office on the grounds of Lisbon airport. Due to space limitations, on 29 January 2010, the new premises of the Museu do Ar (Air Museum), in the municipality of Sintra, opened to the public. This extensive museum is the result of a three-way partnership between airport operator Ana-Aeroportos, the Portuguese Air Force and TAP. The collection on display recounts the history of military and civil aviation in Portugal. Visitors are able to see 40 aircraft, including a TAP Douglas DC-3, simulators, engines and other exhibits. A panel of photographs in the main hangar tells the story of 100 years of aviation in Portugal. In 2007 TAP Air Portugal was awarded by NATO as the Best Engine/Aircraft Source of Repair for the NATO AWACS Maintenance Program and has been distinguished with the highest maintenance and overhaul practice awards from Airbus Industries in 1996, 2000, 2003, and 2005, being certified for full aircraft, engine and component maintenance and overhaul by the FAA, EASA, and several other important certification entities and aircraft manufacturers (Airbus, Boeing and Embraer). In 2010 TAP Air Portugal was awarded the "World's Best Airline Award" by British Condé Nast Traveler magazine, after being rated for its excellence in previous years, and was rated as the "Best Airline to South America" by the World Travel Awards in 2009 and 2010, with nominations for "Europe's Leading Airline" and "Europe's Leading Business Class" in 2007, 2009 and 2010. TAP Air Portugal has also consistently achieved high ranks and various awards from specialized air travel publications such as Skytrax and Publituris due to the company's excellence in service and performance. In recent years, TAP Air Portugal has been consecutively elected World’s Leading Airline to Africa and to South America by the World Travel Awards (WTA), considered the "Oscars" of the world travel industry. In the December 2017/January 2018 edition of the magazine Monocle's Travel Top 50, an annual list, selected by the magazine's editors, awarded Portugal's TAP airline the accolade of "most handsome crew." As of June 2017, TAP Air Portugal serves 87 destinations in 34 countries across Europe, Africa, North America and South America, with some domestic, European and African destinations being operated by TAP Express. TAP Air Portugal is the leading European airline flying to Brazil, offering more destinations from its hub in Lisbon than any other European airline. Many Europeans transit through Portugal to fly to Brazil due to the large number of slots TAP holds on the South American country. The airline is currently[when?] looking to expand its service to Brazil even further, as well as adding new destinations in the United States, in which it currently serves four airports: Boston, Miami, Newark and New-York JFK. On March 2016, TAP Air Portugal began an air shuttle service, designated “Ponte Aérea”, to connect Lisbon and Porto's airports with flights every hour adding up to 18 round-trip flights. It is operated by White Airways on behalf of the regional brand TAP Express. As of 2019 TAP Air Portugal will launch 15 new routes as well as receive 15 new aircraft. Airbus A330-200 14 — 25 — 244 269 5 older aircraft to be replaced by Airbus A330-900neo. Airbus A330-900neo 5 18 34 96 168 298 Launch operator. TAP Air Portugal became the launch customer of the Airbus A330-900 in November 2018 when the airframer delivered to the airline the first aircraft of the type, on lease from Avolon. TAP ordered 21 of these aircraft, of which 10 are directly ordered from Airbus and the rest will be leased. They also estimate to have 133 aircraft in the fleet by 2025 including TAP Express. TAP Air Portugal announced in January 2016 the creation of the new brand TAP Express to replace Portugália Airlines. The acquisition of 8 new ATR 72-600 (to be operated by White Airways crew) and 9 Embraer 190 (to be operated by Portugália crew) replaced the aging Fokker 100 and Embraer 145. A further four Embraer 195 were added to the fleet. TAP Air Portugal offers two different lounges at Lisbon Airport, the TAP Premium Lounge, available for Victoria Gold Winners, Star Alliance Gold members and passengers flying on business class on Star Alliance flights, while Victoria Silver Winners only have access to the Blue Lounge, contracted with the handling subsidiary Groundforce. The aircraft are divided into a two-class cabin: business class (branded as tap|executive) and economy classes (tap|plus, tap|classic, tap|basic and tap|discount). TAP Air Portugal does not offer first class services. On the medium-haul fleet of Airbus A319, Airbus A320 and Airbus A321 aircraft, both cabins have been retrofitted with new leather seats. The executive class offers better privacy than economy class, and more meal options. On the long-haul fleet of Airbus A330 and Airbus A340 aircraft, the cabin is divided into a two-class layout. The economy class of the new Airbus A330's and Airbus A340's is equipped with modern individual LCDs with touchscreen and a complete IFE, while the older Airbus A330's feature an average IFE and older individual screens. The entire fleet of Airbus A340 economy class was refurbished during 2013, adding a new seat design and a new in-flight entertainment system. In business class, seats are capable of turning into lie-flat beds. New Airbus A330 aircraft are also fitted with extra functions. TAP's in-flight magazine is named UP and is available on board, as a fully responsive website (compatible with desktops, smart phones and tablets), and as a freely downloadable application for Apple's iPad. The Portuguese airline will also be the first to take a new cabin layout called “Airspace”. The design allows airlines to add more seats. Victoria Miles Winner, the basic tier, with no mileage requirements. Victoria Silver Winner, (Star Alliance Silver), with a requirement of 30,000 Status Miles or 25 segments flown within one year. Victoria Gold Winner, (Star Alliance Gold), with a requirement of 70,000 Status Miles or 50 segments flown within one year. According to the JACDEC Airliner Safety Report released in January 2011, TAP Air Portugal was rated Western Europe's safest airline and tied for fourth worldwide with three other airlines (Qantas, Air New Zealand, and Finnair). The JADEC report rates TAP Air Portugal well above any of its competitors in its prime geographic operating areas: Europe, Atlantic Islands, Africa, North America and South America. TAP Air Portugal Flight 425: the crash of Flight 425 at Madeira Airport on 19 November 1977 remains TAP Air Portugal's only fatal accident. Flight 425 was flying to Madeira Airport from Brussels via Lisbon. The Boeing 727 crashed while landing on runway 24 in heavy rain. Before the crash, the pilot had made two unsuccessful attempts to land, and had decided to make one more attempt. The plane touched down too late and overran the runway which was, at the time, only 1,600 metres (5,200 ft) long. The plane crashed onto a beach at the end of the runway, splitting into two pieces and bursting into flames. Of the 164 people aboard, 131 were killed and 33 survived. It is the second-deadliest aeroplane accident in Portugal (after Independent Air Flight 1851). The crash prompted officials to explore ways of extending the short runway on Madeira. Because of the height of the runway relative to the beach below, an extension was very difficult and too expensive to perform. A 200 m (656 ft) extension was built between 1983 and 1986. In 2000 the runway was extended to 2,781 m (9,124 ft) long and was capable of handling wide-body commercial jets such as the Boeing 747 or Airbus A340. ^ Thirteen aircraft directly ordered from Airbus and four more ordered by BOC Aviation to be leased to TAP Air Portugal. ^ a b Hofmann, Kurt (4 February 2019). "TAP reports 11.3% traffic growth on African routes in 2018". Air Transport World. Archived from the original on 5 February 2019. ^ "Member Airline Details". www.StarAlliance.com. Retrieved 2 January 2018. ^ "TAP – Air Portugal Fleet Details and History". www.planespotters.net. Retrieved 27 June 2017. ^ "TAP Express Fleet Details and History". www.planespotters.net. Retrieved 27 June 2017. ^ a b "TAP Portugal: ownership changes almost complete, while Azul relationship starts to bear fruit". CentreForAviation.com. Retrieved 2 January 2018. ^ Moreira, Luis. "LUMO Transport – TAP Fleet – Douglas DC-4 (C-54A Skymaster) Pax". www.lumotransport.eu (in Portuguese). Retrieved 15 June 2017. ^ "TAP – Portugal in the air". upmagazine-tap.com. Retrieved 16 June 2017. ^ "TAP sues bankrupt Swissair". Retrieved 16 June 2017. ^ "TAP Maintenance & Engineering". MRO Solutions. Retrieved 24 April 2015. ^ "TAP Portugal to fly to Porto Alegre, Brazil". news.opodo.co.uk. Retrieved 16 June 2017. ^ "TAP Portugal: up to 80% of traffic originates at MIA on new Miami-Lisbon route". The Next Miami. 13 February 2012. Retrieved 16 June 2017. ^ a b c Peláez, Marina Watson (19 October 2012). "Privatisations: Sole Bidder for TAP-Air Portugal". Lisbon, Portugal. Retrieved 23 October 2012. ^ "Agência de notícias de viagens e turismo". www.Presstur.com. Retrieved 2 January 2018. ^ Portugal, TAP. "TAP". TAPPortugal.com. Retrieved 2 January 2018. ^ "Portugal to sell up to 66 pct of airline TAP in relaunched privatisation". Reuters. 13 November 2014. Retrieved 24 April 2015. ^ Anabela Reis (13 November 2014). "Portugal Makes Fresh Attempt to Find Buyer for Flag Carrier TAP". Bloomberg.com. Retrieved 24 April 2015. ^ "The West Australian". The West. Retrieved 2 January 2018. ^ News, ABC. "International News: Latest Headlines, Video and Photographs from Around the World – People, Places, Crisis, Conflict, Culture, Change, Analysis and Trends". Retrieved 2 January 2018. ^ Magalhaes, Luciana (11 June 2015). "Brazil's Azul Airlines Founder Wins Bid to Buy Portuguese Carrier TAP". The Wall Street Journal. Retrieved 30 June 2015. ^ a b "TAP new owners see profits from 2016, to invest up to 800 mln euros". 24 June 2015. Retrieved 2 January 2018 – via Reuters. ^ "Miguel Frasquilho troca presidência da AICEP pela TAP". Sapo.pt. Retrieved 2 January 2018. ^ Cipriano, Rita. "Miguel Frasquilho vai ser "chairman" da TAP". Observador. Retrieved 2 January 2018. ^ "Travel: TAP Portugal to return to original brand name". portuguese-american-journal.com. Retrieved 20 September 2017. ^ "Estatutos TAP." TAP Portugal. Retrieved on 23 February 2010. "A sede da sociedade é em Lisboa, no Edificio 25, no Aeroporto de Lisboa." ^ "Contact Us." TAP Portugal. Retrieved on 15 December 2011. "AEROPORTO DE LISBOA / LISBON AIRPORT ED. 25 - R/C DTO / BUILDING 25 - Ground Floor (right side) 1704-801 LISBOA"
^ a b c Nery, Sérgio. "TAP lança nova campanha institucional na BTL 2011." Jornal de Turismo. Friday 25 February 2011. Retrieved on 24 January 2012. "Para ilustrar esta proximidade e complementaridade entre povos, a portuguesa Mariza, o angolano Paulo Flores e a cantora brasileira Roberta de Sá juntaram para dar voz a uma música contagiante. No video, os cantores profissionais foram acompanhados por um coral, constituído por trabalhadores da TAP." ^ a b Veloso, Maria João. "MORA & AVIS – WITH ARMS WIDE OPEN." (Portuguese: "MORA & AVIS – DE BRAÇOS ABERTOS.") Up. TAP Portugal, 1 June 2011. Retrieved on 24 January 2012. ^ "Mariza, Paulo Flores e Roberta Sá – De Braços Abertos." (Archive) TAP Portugal Official YouTube Channel. Retrieved on January 25, 2012. "These artists were joined in the choir by some of TAP's employees." ^ "TAP Portugal unveiled a new livery". aviationweek.com. Retrieved 16 June 2017. ^ "TAP Portugal". Retrieved 24 April 2015. ^ "TAP Portugal - Star Alliance". Retrieved 24 April 2015. ^ Tap Portugal. TAP Portugal (2012-01-12). Retrieved on 2013-08-20. ^ "What it's like to fly on TAP, the airline with the 'most handsome crew' in the world". ^ a b "Todos os destinos - O local certo para si - TAP Air Portugal". www.FlyTAP.com. Retrieved 2 January 2018. ^ "Profile on TAP Portugal". CAPA. Centre for Aviation. Archived from the original on 31 October 2016. Retrieved 31 October 2016. ^ Liu, Jim (14 June 2018). "airBaltic / TAP Air Portugal begins codeshare service from June 2018". Routesonline. Retrieved 14 June 2018. ^ ttw. "TAP Portugal and Beijing Capital to Codeshare". TravelTradeDaily.com. Retrieved 2 January 2018. ^ Liu, Jim (10 November 2017). "El Al / TAP Air Portugal begins codeshare service from Oct 2017". Routesonline. Retrieved 10 November 2017. ^ Liu, Jim (15 June 2018). "TAP Air Portugal / Nordica begins codeshare partnership from June 2018". Routesonline. Retrieved 15 June 2018. ^ Liu, Jim (10 November 2017). "TAP Air Portugal / Ukraine International expands codeshare routes in W17". Routesonline. Retrieved 10 November 2017. ^ Liu, Jim (22 March 2018). "TAP Air Portugal expands Ukraine International codeshare in S18". Routesonline. Retrieved 22 March 2018. ^ a b "Airbus orders and deliveries". Airbus. March 2019. Archived from the original on 5 April 2019. ^ "BOC Aviation orders four A320neos, two A330neos". flightglobal.com. Retrieved 21 May 2018. ^ "TAP Portugal orders 14 A330-900neo and 39 A320neo Family aircraft". airbus.com. Retrieved 21 May 2018. ^ "TAP gets first A320neo aircraft". theportugalnews.com. Retrieved 21 May 2018. ^ "TAP Air Portugal takes delivery of its first A321LR". airbus.com. Retrieved 5 April 2019. ^ a b c d "Airbus delivers first A330-900 to launch operator TAP Air Portugal" (Press release). Airbus. 26 November 2018. Archived from the original on 10 January 2019. ^ Hofmann, Kurt (26 November 2018). "Launch operator TAP Air Portugal takes delivery of first A330neo". Air Transport World. Archived from the original on 18 December 2018. ^ "Fleet retrofit". www.FlyTAP.com. Retrieved 24 June 2017. ^ LisbonJet. "LisbonJet's Logbook". Retrieved 24 April 2015. ^ "iPad In-Flight Magazines". Retrieved 24 April 2015. ^ "TAP Portugal to Be First A330neo Operator and to Launch Airspace Cabin". AirlinesAndDestinations.com. Retrieved 2 January 2018. ^ "TAP Portugal". www.FlyTAP.com. Retrieved 24 April 2015. Chillon, J., French Postwar Transport Aircraft, 1980, Air-Britain (Historians) Ltd, ISBN 0-85130-078-2. Marson, Peter J, The Lockheed Constellation Series, 1982, Air-Britain (Historians) Ltd, ISBN 0-85130-100-2.